Although Machu Picchu is by far the most famous of the Inca remains in Peru, it certainly isn’t the only one. There are a host of other cities of the Incas that were once part of this great civilisation – we’re going to give you some information about them and explain just why you should make the effort to visit them. Sacsayhuamen is really easy to explore if you’re planning to tackle the Inca Trail and hike to Machu Picchu. This is because it’s conveniently situated just outside Cusco, where you’ll spend a good few days acclimatising before you begin your trek. Sadly, Sacsayhuamen was quite badly damaged by the Spanish when they gained control of the region, but some of its defensive walls were so large and strong that they still stand to this day. Their construction is impressive, with huge granite blocks used to make them appear utterly impenetrable. You’ll find Sacsayhuamen on a hill overlooking Cusco, so a trip here also provides the chance to take in some spectacular views. 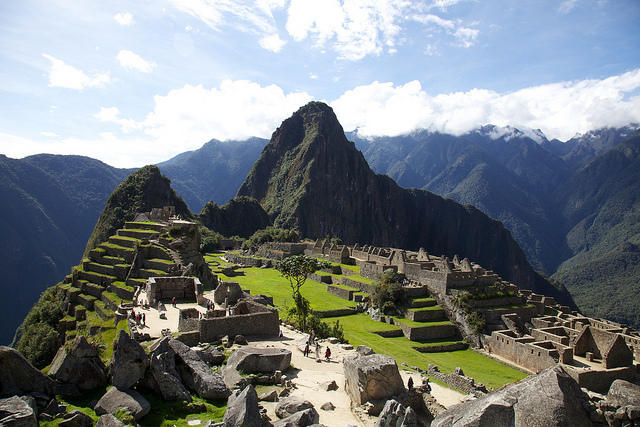 As the most famous of the Inca cities, you couldn’t visit Peru without discovering Machu Picchu. Many tour operators – including Explore Worldwide – offer treks along the famous trail to these breathtaking ruins. What makes Machu Picchu so special – and one of the reasons why it’s been designated a UNESCO World Heritage Site – is that it was one of the only Inca sites that wasn’t discovered by the Spanish, which means it’s in excellent condition. There are temples, terraces and incredible walls on the site that will astound you, especially as their architecture seems to blend in with the mountainous landscape that surrounds the city. Also within easy reach of Cusco is Pisac, a set of ruins that overlook the Urubamba River. This site is reasonably large, and is well worth a visit to see the interesting irrigation system that the Incas installed, as well as the relatively complete stone walls that are made up of precisely carved blocks. There’s an impressive stone staircase that runs between the various agricultural terraces – if you’ve got the energy to follow it all the way to the top, you’ll have amazing views over the valley. Ollantaytambo is another fascinating Inca site to visit in Peru and it too is within reach of Cusco. This is still a living town, although unlike the other former Inca settlements its original walls and layout have been retained. So, a visit here is a wonderful way to get a greater insight into how the Incas lived and to see their architecture surrounded by the hustle and bustle of a thriving community rather than in the context of an archaeological site. Above the town itself are a series of stone terraces and it’s here that the Incas would position themselves to defend Ollantaytambo. This was actually the location of the biggest Inca victory over the invading Spaniards in the 16th century, so there’s a lot of history to discover in this spot. There are also some Inca storehouses on one of the hills behind Ollantaytambo and this site is free to explore – although you’ll have a bit of a climb to get there. As well as the remains of the stores, you will also find outstanding views over the town and the other Inca ruins in this part of the valley.